With on-column injection a liquid sample is introduced directly into the column with a thin injection needle. During the course of the temperature program the vapour pressure of the solutes increases and the chromatographic process begins. With this injection technique no evaporation in a heated space takes place. By using an initial temperature below the boiling point of the solvent, selective evaporation and, hence, discrimination is precluded. This is why on-column injection is sometimes chosen for samples containing high-boiling components that would not be quantitatively transferred to the column in split- and splitless injection. Both on-column and splitless injection techniques are suitable for analyzing trace analytes (analytes in the part-per-million level or less in the final injected sample). Each technique offers advantages over the other, and frequently the choice of technique is a compromise between varieties of variables. The OPTIC inlet can also be used for on-column injections. GL Sciences has designed a tool that enables true on-column injection using OPTIC inlet without an on-column liner. The on-column tool is very easy to install without any press fit connection. The syringe needle (gauge 26) goes really into the retention gap where the injection takes place. 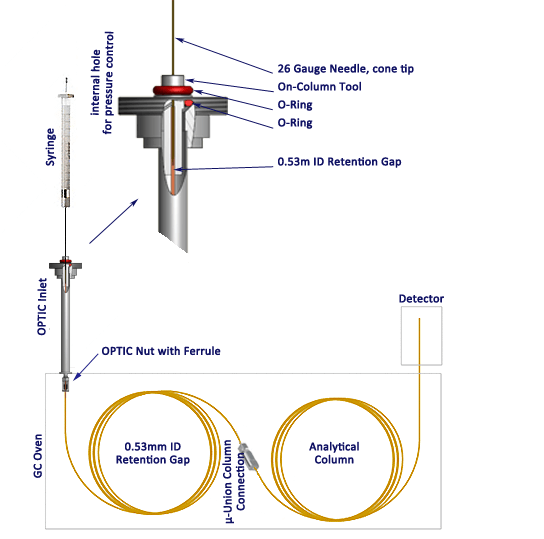 The introduction of this novel On-Column kit for OPTIC 3 and 4 allows this reference technique to be used with the world's most versatile inlet, easily switching between techniques to get a reference chromatogram before optimizing techniques such as Large Volume Injection or Dirty Matrix Introduction or indeed permanently using the On-Column technique for the most demanding sample types. The two most common techniques for LVI are cool on-column (COC) injection with partially concurrent solvent evaporation using a solvent vapor exit (SVE)and programmed temperature vaporization (PTV) injection in the solvent vent mode. Both techniques can be done using the OPTIC Inlet.